Our first stop on our Pilgrimage of Sacred Spaces to Detroit was the Islamic Centre of America in Dearborn, Michigan, where we were welcomed with warmth and respect and kindness. 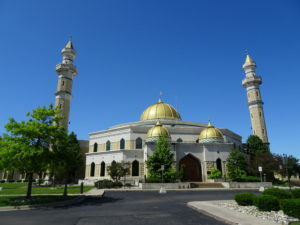 The Islamic Centre is the largest mosque in America, and built in the most densely populated Arab community in North America. 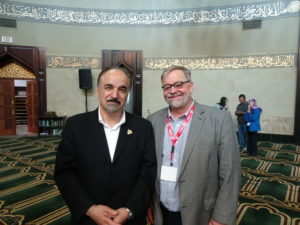 However, being known as the largest mosque in America has made this faith community a target most notably by a fundamentalist preacher from a tiny church in Florida who announced to the world he would burn a copy of the Koran in front of the Islamic Centre a few years back. While this hate filled fanatic hid behind his constitutional right to religious freedom, he failed to see that his actions were a direct assault on the religious freedoms of another. Where one group’s religious freedom is violated, religious liberty is violated for all. The good news is that on the day before the assault Christians, Jews, and even atheists held a rally in support of the mosque, in which they held hands in unity around the exterior while on the day of the fundamentalist preacher’s visit, quite deliberately, no one was there. It was a wonderful reminder that on many levels we must work together. As it turns out the mosque is very adept at this. 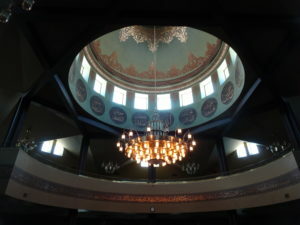 Some time after the mosque was completed there was still decorative work to be done on the interior. The community sent several leaders of the mosque to Lebanon to seek out a professional person with experience in decorating such a space. The ideal person happened to be an Armenian Christian who came, but only after insisting he not be paid and that whoever worked with him do the same. 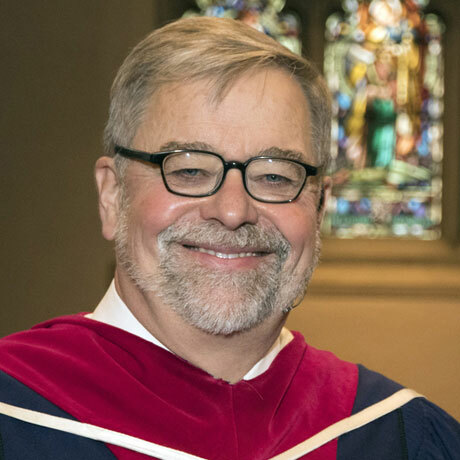 He built a significant team of volunteers to assist him and again he insisted they represent a broad range of religious traditions including Christian, Jewish and non-believers. We were blessed to see the decorative work fully completed.